I recently appeared on CNBC to talk about everyone’s favorite government agency, those warm and cuddly folks at the IRS. Our tax system is a dysfunctional mess, but you’ll notice that I mostly blamed politicians. After all, they are the ones who have unceasingly made the internal revenue code more complex, starting on that dark day in 1913 when the income tax was approved. But I don’t want to give the IRS a free pass. I’ve cited IRS incompetence and misbehavior in the past, most notably when discussing political bias, targeted harassment, and other shenanigans. And, as illustrated by these five examples, we can always cite new evidence. Such as lack of accountability. …a new report from the Cause of Action Institute reveals that the IRS has been evading numerous oversight mechanisms, and it refuses to comply with laws requiring it to measure the economic impact of its rules. Congress has passed several laws, including the Regulatory Flexibility Act and the Congressional Review Act, that require agencies to report on their rules’ economic impact to lawmakers and the public. …These good-government measures are meant to ensure unelected bureaucrats can be checked by the public. …the IRS has made up a series of exemptions that allow it to avoid basic scrutiny. The agency takes the position that its rules have no economic effect because any impact is attributable to the underlying law that authorized the rule. The Internal Revenue Service (IRS) issued more than $1.7 million in awards in fiscal 2016 and early fiscal 2017 to employees who had been disciplined by the agency, a Treasury Department watchdog said. “Some of these employees had serious misconduct, such as unauthorized access to tax return information, substance abuse and sexual misconduct,” the Treasury Inspector General for Tax Administration (TIGTA) said in a report made public this week. …in fiscal 2016 and early fiscal 2017, the IRS had given awards to nearly 2,000 employees who were disciplined in the 12 months prior to receiving the bonus. By the way, the IRS has a pattern of rewarding bad behavior. Such as pursuing bad policy. …for 35 years the Internal Revenue Service has exempted itself from the most basic regulatory oversight. …Tax regulations (like all regulations) have exploded in recent decades, and of course IRS bureaucrats impose their own policy judgments. The IRS has in recent years unilaterally decided when and how to enforce ObamaCare tax provisions, often dependent on political winds. In 2016 it proposed a rule to force more business owners to pay estate and gift taxes via a complicated new reading of the law. …Secretary Steve Mnuchin’s Treasury…department is inexplicably backing IRS lawlessness with a string of excuses. Again, this is not the first time the IRS has interfered with congressional policy. Such as stifling political speech. The Internal Revenue Service infamously targeted dissenters during President Obama’s re-election campaign. Now the IRS is at it again. Earlier this year it issued a rule suppressing huge swaths of First Amendment protected speech. …The innocuously named Revenue Procedure 2018-5 contains a well-hidden provision enabling the Service to withhold tax-exempt status from organizations seeking to improve “business conditions . . . relating to an activity involving controlled substances…” The rule does not apply to all speech dealing with the listed substances, only that involving an “improvement” in “business conditions,” such as legalization or deregulation. …This is constitutionally pernicious viewpoint discrimination. In other words, the bureaucrats didn’t learn from the Lois Lerner scandal. Now that I’ve hopefully convinced people that I’m not going soft on IRS malfeasance, let’s look at the budgetary issue that was the focus of the CNBC interview. Is the IRS budget too small? Should it be increased so that more agents can conduct more audits and extract more money? Both the host and my fellow guest started from the assumption that the IRS budget has been gutted. But that relies on cherry-picked data, starting when the IRS budget was at a peak level in 2011 thanks in part to all the money sloshing around Washington following Obama’s failed stimulus legislation. Here are the more relevant numbers, taken from lines 2564-2609 of this massive database in the OMB’s supplemental materials on the budget. 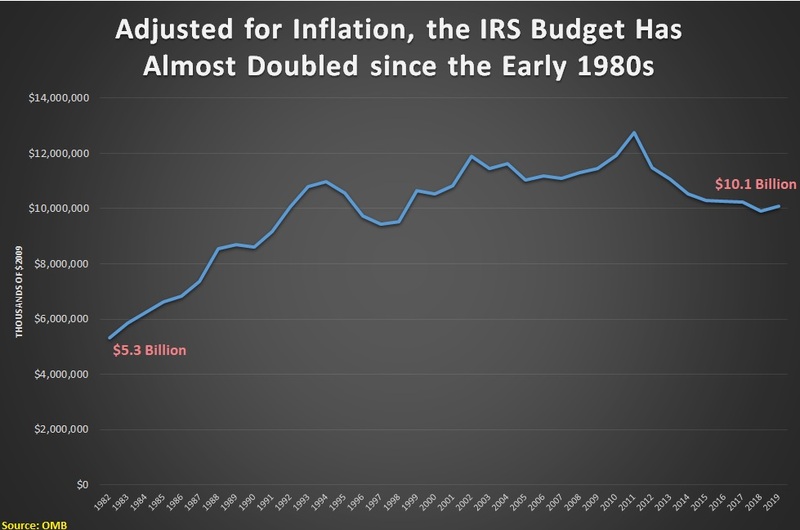 As you can see, IRS spending – adjusted for inflation – has nearly doubled since the early 1980s. In other words, we shouldn’t feel sorry for the IRS and give it more money. To augment these numbers, I made two simple points in the above interview. First, we should demand more efficiency from the bureaucracy. Second, we should reform the tax code to eliminate complexity. The latter point is especially important because we could dramatically improve compliance while also shrinking the IRS if we had a simple and fair system such as the flat tax. Last but not least, here’s a clip from another recent interview. I explained that the recent shutdown will be used as an excuse for any problems that occur in the near future. Standard operating procedure for any bureaucracy. P.S. My archive of IRS humor features a new Obama 1040 form, a death tax cartoon, a list of tax day tips from David Letterman, a Reason video, a cartoon of how GPS would work if operated by the IRS, an IRS-designed pencil sharpener, two Obamacare/IRS cartoons (here and here), a collection of IRS jokes, a sale on 1040-form toilet paper (a real product), a song about the tax agency, the IRS’s version of the quadratic formula, and (my favorite) a joke about a Rabbi and an IRS agent. We moved from 90% agrarian to single digits, but it was over a century or so. AI will cause disruption much faster, and people or jobs cannot adapt that fast. We need to help during that transition. The current safety-net will be swamped. Eventually AI will be very profitable and we can tax those profits, to support those out of work. However, initially those profits will not obtain, with the front end cost of the AI equipment cutting profitability. In the long term, profits and efficiency of AI will filter through the system to benefit all, but the transition is going to be horrible for some. During this period, many will challenge capitalism. We’ve already seen the rise of socialist idiots. I have recommended a UBI, but I’m open to other ways to save capitalism. If capitalism is insensitive to the plight of the unemployed during this transition, voters may turn ugly. A UBI can be set at a reasonable level. For example, the poverty level; which could be paid for with what we are spending now (some safety-net, all tax deductions, all subsidies). That level is about $10,000 per adult and $2,000 per child. There are those that don’t like a UBI, but wouldn’t it be better than our awful welfare system? The disincentives against work are awful, in some cases loss of benefits plus tax equals more than 100% effective tax! Do you really believe we can get rid of welfare, without replacing it with something else? Over the past few centuries, there have always been ‘frightening speculations’ of the apocalypse coming. It usually doesn’t. Is it different this time? Will AI and robotics end jobs? Unlikely to happen. Unlikely to happen soon. To the extent it does happen, it will cause great prosperity. So, we should react sensibly. As for the apparently alarming fact that only 62.9% of Americans participate in the labor force, this is not unusual. This metric includes everyone over 16 years old, so it includes students, retirees, and non-working spouses. Over the past seven decades, the labor force participation rate has ranged from 59% to 67%, so 63% is not that unusual. Zeroing in on true working-age adults, we apparently had problems with low workforce participation from 2008 to 2015, but it improved from 2016 to present. As of Jan 2019, it’s still a bit low compared to the experience of 1989-2008, but about three-fourths of the drop has been reversed. Not great, but not alarming. The Works Progress Administration (WPA; renamed in 1939 as the Work Projects Administration) was an American New Deal agency, employing millions of people (mostly unskilled men) to carry out public works projects, including the construction of public buildings and roads. In a much smaller project, Federal Project Number One, the WPA employed musicians, artists, writers, actors and directors in large arts, drama, media, and literacy projects. Almost every community in the United States had a new park, bridge, or school that was constructed by the agency. The WPA’s initial appropriation in 1935 was for $4.9 billion (about 6.7 percent of the 1935 GDP). our infrastructure is a mess… the question is do we just give people money… or have them work for it? @nedlandp, I’m skeptical of UBI for reasons that Dan has outlined, but I have a political question for you. If UBI is a political winner, why did the Swiss overwhelmingly vote against it? A flat tax is a political loser. It taxes the poor and gives a break to the rich. Add a UBI, and you have a political winner. Smooth effective tax rates from zero to the flat rate, based on level of income. (Paid for by getting rid of federal welfare, some other safety-net, deductions, and corporate subsidies.) Think of the UBI as a capped substitute for deductions. A large standard deduction would do the same, but that is inefficient, because it would require individuals filing annually. With a UBI, companies could withhold accurately, no matter how many sources of income you have. A std deduction also creates a two tier system (zero and flat rate), not a flat rate. No. Bureaucrats did learn from the IRS scandal. No one went to jail.